There are many questions, claims, controversies and conflicting information about pH and skin. One company claims their product is “pH balanced for skin”. 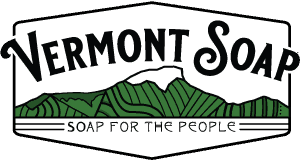 Another company claims their products are made without the questionable chemicals in the “pH balanced” soap product. Basically each camp has a stake in the answer. What is up with this? Here is the real skinny on pH, soap and skin based on real science. Remember 99.72% of cosmetic claims are complete fabrications. Your skin makes a lightly acidic secretion to help protect itself. This is called the Acid Mantle. Because it is acidic, the most effective way to clean it off, along with excess oils, dirt and germs, is using an alkaline foaming system (soap!). Your skin begins resecreting the mantle immediately. Within 20 minutes it is about 1/3 strength and with 2-3 hours it is back up at full strength. This varies slightly person to person, and there are rare cases of this mechanism failing in very sick individuals. In other words – this is an absolute non-issue. There is no health reason to choose a “pH balanced” soap or body wash product over a natural alternative, assuming pH levels are within say 3.30 or so (like an orange) and 10 (such as a bar soap). It is interesting to note that the mildest cleanser you can use – properly made handmade style bar soaps – also have the highest pH at 10.01. We have testimonials of dry skin conditions disappearing after just a few days of handmade soap use, (Testimonials) so don’t let anybody tell that mildness equals low pH – it just ain’t so! Poorly quality and mass market bar soaps usually have Free Alkali in them, this is what makes them harsh and drying. Basically, the manufacturers are allowing there to be some left over alkali in the soap. This is good for shelf life and increases lather in “pH balanced” soap or body wash, but is too drying for sensitive or dry skin. Free alkali will find every last bit of natural oils in your skin and saponify them (turn them into soap), leaving you dry and “squeaky clean”. Too high a coconut oil percentage in the formula (coconut oil harshness), along with the usual artificial color and fragrance marketing enhancements also make mass market soaps harsh and drying to many individuals. The reason this non issue of “pH balanced” soap or body wash became a marketing war, is that detergent products (see the sulfate controversy: Sodium Lauryl Sulfate ), have a pH that is more acidic than soap or other skin care products. Marketers use this to promote their wares over the next guys. Thing is, about 12% of us are sensitive to detergents. Others are sensitive to the preservatives, colors and fragrances used by mass marketers in both soap and detergent systems. How do YOU, the concerned consumer, who cares enough to read this missive, make intelligent buying decisions? Humans came from the Earth. We are made of the stuff of the Earth; it’s chemical groups and materials. Our bodies can handle, or not handle, the natural chemical groups we encounter in plants, animals and minerals found in our environment. Over the past 100 years or so, humans have flooded the land, sea, air, food supply, and personal care products with chemicals never or rarely seen before on this planet. What ARE we thinking? This is clearly a mistake. Cancer and auto-immune disorders are off the charts, and no end in sight. Climate is changing, sea levels rising. It is a tiny, tiny thing to choose to use Organic soap or body wash as opposed to a “pH balanced” engineered petrochemical foaming agent. The future of Western Civilization will not rise or fall based on this. Or will it? If all of us, now, make tiny decisions with our skin care products, like this one, every day; even monolithic corporatism will be forced to respond. Handmade soap is GOOD for your sensitive skin! The proof is in the pH. Organic handmade bar soaps (pH 10.01) have a healthy free fatty acid and triglyceride content. Studies have shown that after being washed with soap and water, free fatty acids help skin recover its natural pH balance faster.